Stuart Criminal Defense Lawyer | ADL Law, P.A. When your freedom is on the line due to a criminal accusation or a wedge has been driven between your family requiring legal action, you can call on ADL Law, P.A. for help. Attorney Adam Less has years of experience and comprehensive insight to offer for your case. As a member of the Florida State Bar, our founding lawyer is licensed to handle various criminal defense and family law matters on Floridians' behalves. ADL Law, P.A. is the firm that you can trust to aggressively defend your constitutional rights—both inside and outside of the courtroom. Whether you are in the middle of a family law battle or at risk of a potential conviction, you have a right to tell your side of the story. Let ADL Law help make your voice heard. Contact us today at (772) 210-9097 for your consultation with a criminal defense lawyer in Stuart! Adam Less knows what it takes to win your case. and your loved one's best interests in mind. Attorney Less is a former police officer who uses his insight about the other side for the benefit of his clients. Whether you have been accused of a crime or find yourself in a family-related legal battle, you deserve to be fully covered under the law's protection. Attorney Less is here to ensure that you have a fair chance at justice and don’t become lost in the system. 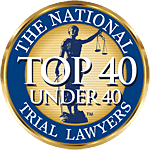 Our founding attorney has received many prestigious accolades throughout his years in practice, strengthening his reputation in the community each day. Among his many accomplishments include receiving Avvo's Client's Choice Award for Criminal Defense—two consecutive years in a row from 2014-2015. Additionally, Attorney Less has been awarded as a 2018 Top 10 Lawyer for Client Satisfaction by the American Institute of Criminal Law Attorneys. We Know Both Sides of the Law. Put Our Insight to Work for You. Above all else, our clients come first. Attorney Less spends the entire duration of your case pursuing your best interests. We know how the outcome of a criminal or family law matter can affect your life, and that is why we take the responsibility of protecting your constitutional rights seriously. Entrust us to work towards obtaining a positive outcome on your behalf. Our founding attorney's experience as a former police officer equips him with invaluable insight into the policies and procedures of the other side. Attorney Less is a proud member of the Florida State Bar, as well as licensed Federally, proving that he is more than qualified to handle your criminal defense or family law case. As firm believers in constitutional rights, ADL Law focuses our efforts safeguarding them on behalf of families and the criminally accused throughout the Treasure Coast. ADL Law, P.A. knows how emotionally taxing legal matters involving your family, or your freedom can be. We are here to help you get through it. Contact us today by calling (772) 210-9097 or filling out our online form. What Our Clients Have to Say, Matters Most.